Vauni Globe is a ventless, free-standing fireplace that runs on bioethanol, a biofuel made from plants, such as beets or corn. 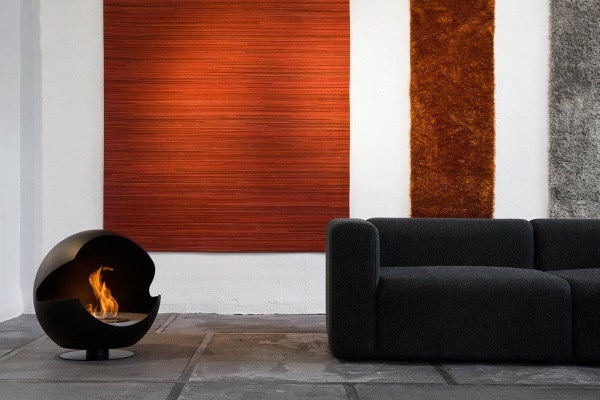 Pivoting 360 degrees, this fireplace is the perfect blend of traditional and contemporary. A lovely addition to any home, it is attractive to look at, whether the fire is on or not. Handmade in Sweden, each globe is one-of-a-kind. The exterior comes in a variety of colour finishes to match your décor. You can also choose the foot height you prefer (high or low). Vauni Globe is equipped with the safest, most efficient bioethanol burner on the market, producing zero smoke or ashes. You can also adjust the intensity of the heat and size of the flame. At over € 2000 per unit, it is a beautiful way to warm up those cold winter nights.